It's one thing to swim with dolphins in our state of the art dolphin center in Freeport, but it is a completely different experience to join these same dolphins out in the open ocean. Our Dive with the Dolphins tour welcomes certified scuba divers to experience our most unique dolphin encounter deep beneath the surface of the water. You will get to dive with the dolphins in the clear warm waters off the coast of Freeport, swimming some 30 to 40 feet beneath the surface of the water among the beautiful and thriving coral reef ecosystem of the Bahamas. Seeing these bottlenose dolphins swimming deep in the ocean is a marvelous experience. These dolphins are at home here beneath the surface of the water. And thanks to their social and friendly nature, they will be the perfect companions for a Freeport Bahamas scuba diving trip. There are many different types of scuba diving options in Freeport, and this one continues to be one of our guests' favorite scuba diving trips. Dolphins are beloved around the world not only because they are beautiful to look at, but interacting with them is endlessly enjoyable. If you are a dolphin lover and a certified scuba diver, do not miss the chance to dive with the dolphins right here on the beautiful Bahamian city of Freeport! Space for these tours are very limited and we only run the tour a few times a week. 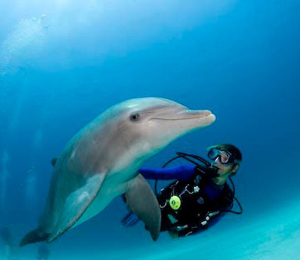 You will be diving with our especially trained dolphins, who will stick around during your diving experience. There is nothing quite like swimming with the dolphins in their own natural habitat! I have been to the Bahamas many times, but Dive with the Dolphins is one of my favorite trips! It includes everything that everyone should do here. As a Bahamas veteran, I can say only the best about this experience!